One electrical device which serves as a model for cosmic plasma activity is the capacitor. A capacitor is a device for accumulating and storing electric charge. It is made of two conductors separated by an insulating medium. When charge is placed on one conductor it attracts charge of the opposite polarity on the other conductor. As a result, an electric field is set up between the conductors, a reservoir of electrical energy. In both everyday electronics and advanced plasma research the capacitor is important for its ability to rapidly store and release electrical energy. Some of the highest energy experiments in the world are performed using large rooms full of charged capacitors to produce intense discharges. As the charge on the capacitor increases, the electric field between the conductors will increase, placing a growing stress on the insulator. At some critical point, the insulator breaks down and the capacitor "short circuits," releasing the stored electrical energy suddenly. Such breakdowns may destroy a solid insulator and with it, the capacitor. However, if the charging rate is slow and the insulator is air or liquid, the damage may repair itself as fresh insulating material rushes in. That is a "self-repairing" capacitor. If the current is strong or the insulator weak, current will pass between the conducting plates, either steadily or in bursts. This is called a "leaky capacitor." Power transmission lines form large-scale capacitors with the air as insulator between the conducting wires. The geometry makes the electric field strongest at the wire surface, which is where the air is likeliest to "break down" and discharge. The hissing and crackling you hear when standing under a power line is just this intermittent leakage. Many natural systems form capacitors as well. For example, the Earth's surface and its ionosphere are two conducting layers separated by air. 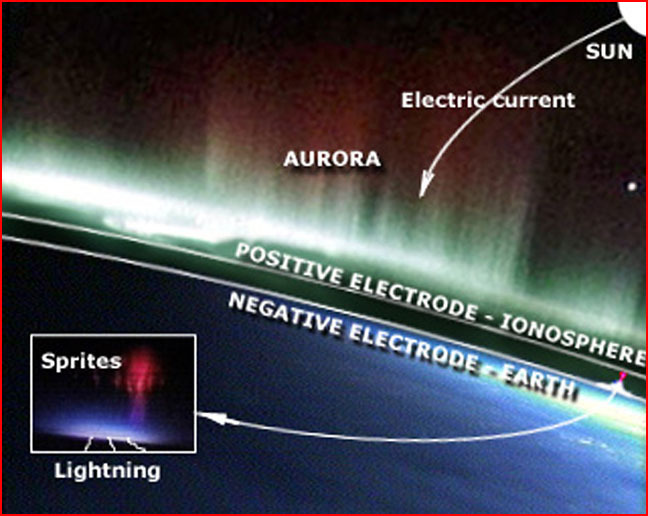 The surface-ionosphere capacitor is of particular interest in the study of sprites. Small "leaks" in the form of lightning can trigger much larger "leaks" (sprites, etc.) at high altitudes above them. In the electric universe, this effect can be traced via auroral circuits, through the circuitry of the solar system, and far into interstellar space. 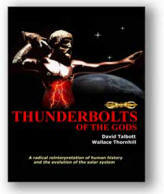 From this viewpoint sprites and lightning are merely leakage currents trickling off the galactic power line. But clearly, the degree to which electric potential from the galaxy powers thunderstorms on Earth has yet to be investigated.